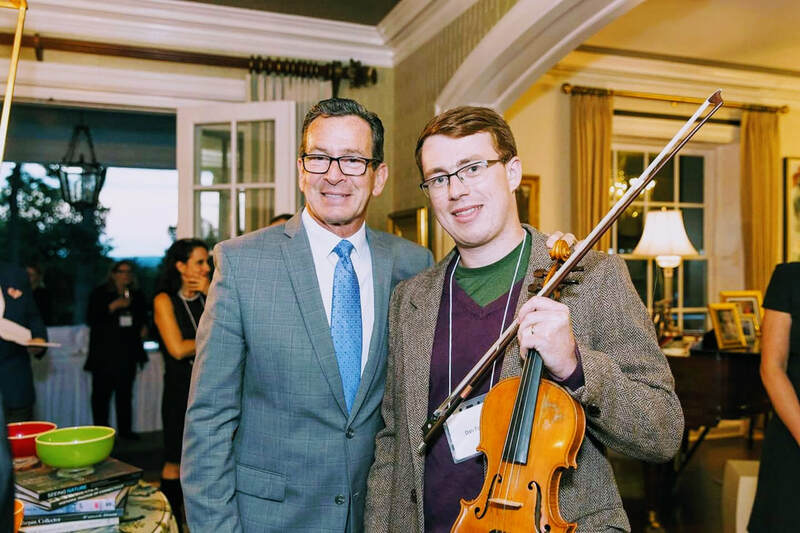 Dan is highly experienced in providing live fiddle music for many events such as weddings, private parties, cocktail hours and house concerts since. His vast repertoire of tunes will be carefully selected to suit any atmosphere ~ from graceful slow airs, Old-Time Waltzes, lively jigs & reels, Turlough O'Carolan melodies, Yiddish and Klezmer tunes and other gentle classical violin pieces. "The idea was to find someone who could play an old Irish fiddle at my daughter’s wedding. That fiddle sat patiently encased in a scuffed-up old leather case for over 70 years. It belonged to Matthew McCabe, our daughter’s great grandfather who (like Dan!) emigrated in his early-twenties to the US. The story is that Matthew’s fiddle playing could be enjoyed at pubs and parties throughout his day. Unfortunately, none of his descendants have heard, and only one has met, Matthew. The violin needed repair and, as recommended, we chose to preserve its existing character—a fiddle that expressed “…grandfather’s character (aka “repair” work)”. Following the repairs, we needed someone to play it. That’s where Dan Foster came in. Dan was highly recommended and he graciously agreed to at least have a look at the old fiddle. We met Dan at the Playwright Irish Pub in Hamden. The fiddle was uncased and passed around with nodes and raise eyebrows before it was handed over to Dan. He plucked, tuned, and eyed its every defect. Turning to us he said, do you mind if I play the first set with it. As he played, the tears began to well up. After 70 years of silence, Dan brought it back to life. It was beautiful. When he finished, he turned to us and said, “It’s quite good.” Actually, Dan is quite good. After a few more sets, he agreed to play it at the wedding. We understand that bond a musician has to his instrument, so we did not require Dan to use the old fiddle for every tune. There were two very special moments when Dan made Mathew’s fiddle come to life. The first was his amazing rendition of Loftus Jones (a Turlough O’Carolan composition). The next came when we introduce Dan and the story behind Mathew’s fiddle to the wedding party. Dan began to play and clearly carried the crowd with him. To the applause and shouts of encore, Dan paused a moment before launching into an Irish jig. The crowd began to clap in time and ended with a standing ovation when he was done.